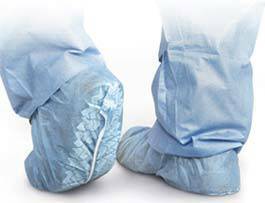 Having the proper cleanroom shoe covers helps limit the number of contaminants entering your environment. Because operators themselves are the leading source of cleanroom contaminants, outfitting them with the proper disposable attire is critical. Not every environment requires the same type of cleanroom shoe covers, however. Ultimately, the best type for your company will depend on a number of different factors. In order to be considered cleanroom compatible, shoe covers must meet some specific requirements. For instance, basic fabric shoe covers might work for open houses and other general applications, but in cleanrooms, they’re liable to release fibers and compromise your environment. Shoe covers made from non-woven materials, however, are better suited for cleanrooms because they reduce particulate release. Specifically, spunbound polypropylene is the go-to choice for shoe covers to be used in cleanroom settings. In addition to materials, you’ll also want to consider any other features your shoe covers may need, such as conductive strips. Conductive strip shoe covers are designed to reduce static and will help keep even your most static-sensitive cleanroom devices protected. Water and abrasion resistance are additional features you may need to consider, depending on the type of work performed in your environment. Donning a pair of shoe covers shouldn’t interrupt an operator’s workflow. Thus, you should seek out shoe covers with a slip-on design to make the process as convenient as possible for employees. It’s also helpful to have shoe covers available in a range of sizes, as your operators likely have different shoe sizes. Additionally, clunkier shoe styles could make it difficult for operators to wear covers that are too small in size, so it’s always wise to keep larger sizes on hand. That being said, shoe covers that are too large (XL and up) for the wearers with smaller feet may leave too much extra fabric and increase the risk of slips or tears. Take a look at the measurements of the covers when placing your order to make an informed decision before purchasing. 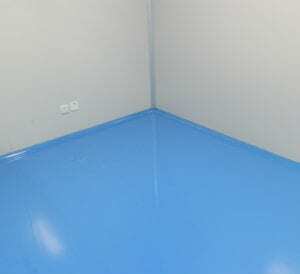 More than likely, your cleanroom likely has a smooth floor. When coupled with the fabric of shoe covers, smooth floors are notorious for causing slips. To keep your operators safe from slips and falls, you may want to consider shoe covers with added traction. In order to reduce slips, these shoe covers are specially designed with small strips on the sole for gripping the floor better than regular covers, or the entire sole is slip resistant. They are available in a variety of seizes and are just as safe for use in cleanrooms as other options. Made from spunbound polypropylene, skid-free shoe covers are among the most highly sought-after options for cleanroom operators. Harmony Business Supplies has a broad range of affordable cleanroom shoe covers available to meet your company’s unique needs. You can check out our extensive selection of shoe covers as well as additional disposable apparel online.